New Delhi, January 31: The interim budget session began today with President Ram Nath Kovind addressing both the houses of the parliament in the presence of PM Narendra Modi, Vice President M Venkhaiah Naidu, Lok Sabha speaker Sumitra Mahajan and other ministers at the national capital on Thursday. 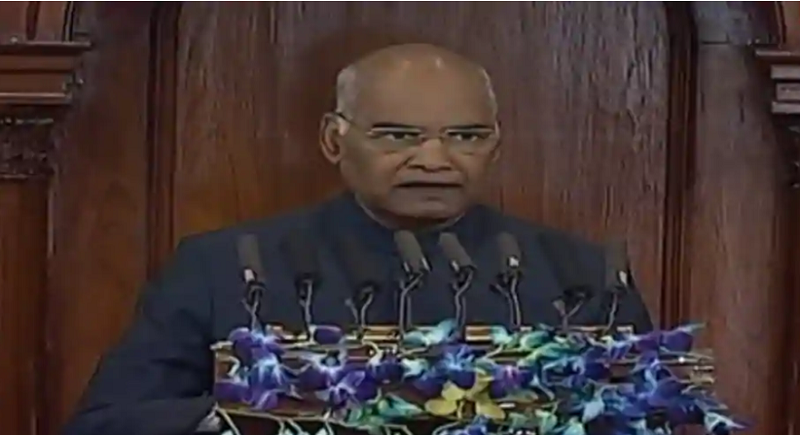 This however marks President Kovind's last such address to the 16th Lok Sabha as the tenure of the current Lower House of Parliament is set to end soon. “This year, our country is also celebrating 70 years of becoming a Republic. I am happy that we are progressing ahead with the ideals set by Dr B R Ambedkar and Gandhiji. Before 2014, India faced many problems, economic and social. It is the NDA government that is striving to make the nation a new India, a transparent nation. In the past four and a half years, the government has built a new hope in the minds of people. We aim to make each and every person capable to stand by its living”, said Koving while addressing both the houses of the parliament. President Kovind highlighted and lauded the progress made by the Centre in areas of sanitation and healthcare. He also highlighted Centre’s providing gas connections and rolling out of the Ayushman Bharat scheme. “More than 10 lakh people have been benefitted under the Ayushman Bharat scheme and more than 13 crore families with the gas connections under the UJWALA Yojana”, he said. “Most of our mothers, sisters and daughters would remain sick because of the smoke released from stoves and thus, the health of the whole family would be affected. 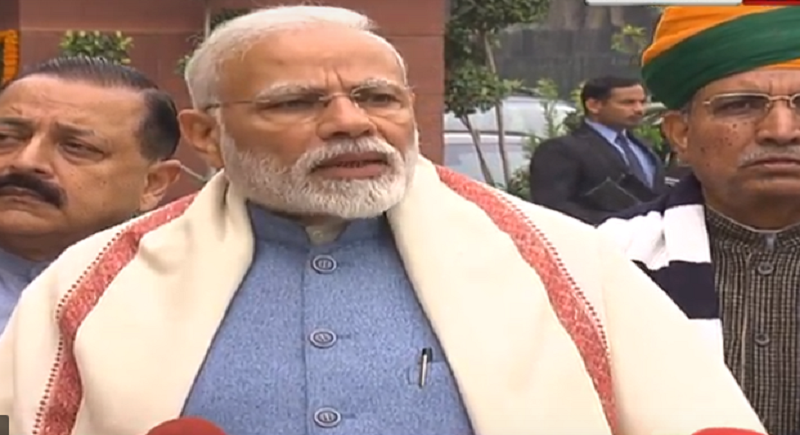 It is only in the period of four and a half years, that my government has added a total of 13 crore households to the gas connection”, he added. “We are ready to have discussion on every issue. This budget session hopefully benefits the huge masses. I look forward to the positive outlook of the parliament in this session. We have been following the value of ‘Sabka Saath, Sabka Vikaas’ and striving to make our country a ‘new India’. 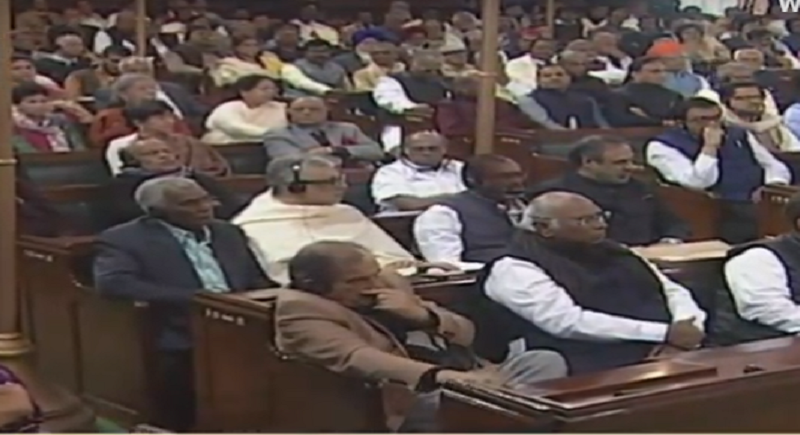 We are committed to this and working to gain everyone’s support in the parliament as well”, PM Modi had said. “Government is opining new health and wellness centres. All India Institutes of Medical Sciences (AIIMS) are being opened in various locations. My government is working towards eradication of malnutrition in women and children. Mission Poshan has been rolled out for food and the Indradhanush scheme is almost close to achieving target of vaccinating children”, the President added further. “Electricity has reached almost every village. Now, India is quickly moving towards a situation where every household will have electricity”. In the last four years, more than 1.3 crore houses have been built under the government's rural housing scheme. I am happy to inform you that the benefits of government’s schemes are reaching poorest of the poor. Listing out the achievements of the ruling NDA government further, during the Budget session, President Ram Nath Kovind said that over nine crore toilets were built under NDA’s flagship of Swachh Bharat Mission. Stressing at the judicial system aligned in the nation, Kovind said, “To end all kinds of injustice in the country, the government has taken a lot of steps. We have decided to punish rapists of minors with death sentence. We have also brought up the issue of triple talaq to fight for the rights of women”. The government is trying to bring about an end to the practice of triple talaq. It has also taken the historic step to provide reservation to the economically weaker and poor. Focussing over the Citizenship amendment bill passed by the parliament, Kovind assured that the Bill will make it easier to provide Indian citizenship to those who had to take refuge in India after facing oppression somewhere else. “They were not at fault, they were victims of situations like that”, he said. “Women have been the greatest beneficiaries of the Pradhan Mantri Mudra Yojana. Six crore women have also joined self-help groups under the Deendayal Antodaya Yojana. Maternity leaves have been extended from 12 weeks to 26 weeks”, he informed meanwhile. It is because of the government’s Jan Dhan Yojana that the bank accounts of over 34 crore people have been opened in the country and almost every family has been linked to the banking system. The scheme had however helped add Rs 88,000 crore to the formal economy. “According to an international agency, 55 percent of the total bank accounts opened between 2014-2017 were opened in India itself”, he said. Talking on the farmer’s distress, Kovind said that the government is working on policies to empower farmers. “The minimum support price (MSP) of crops has been increased to benefit farmers”, he said. The government has strong steps against black money. Agreements have been noted with countries considered as tax havens. “Also, demonetisation was a major step against black money, it brought unaccounted cash back into system. Shell companies were forced to close shop meanwhile,” he said. He supported the Centre’s decision of the Goods and Services Tax by saying that the implementation of the Goods and Services Tax (GST) has made business easy in every part of the country. “GST is a long-term policy which is making business transparent. GST is a boon for business and some changes have been made to it after suggestions from the business community”, he added. While saying that the number of passport centres in the country has increased and that people don’t need to go big cities anymore to get their passports made, the president also confirmed that India is now the world’s second largest manufacturer of mobile phones. “All the people of various professions have helped the government to achieve the targets. This is how the government has strived and is striving hard to work of the betterment of the nation. ‘Sabka Saath, Sabka Vikas’ is the value and principle we adhere to, to make India a novel place, a transparent one and a mature nation”, he signed off.